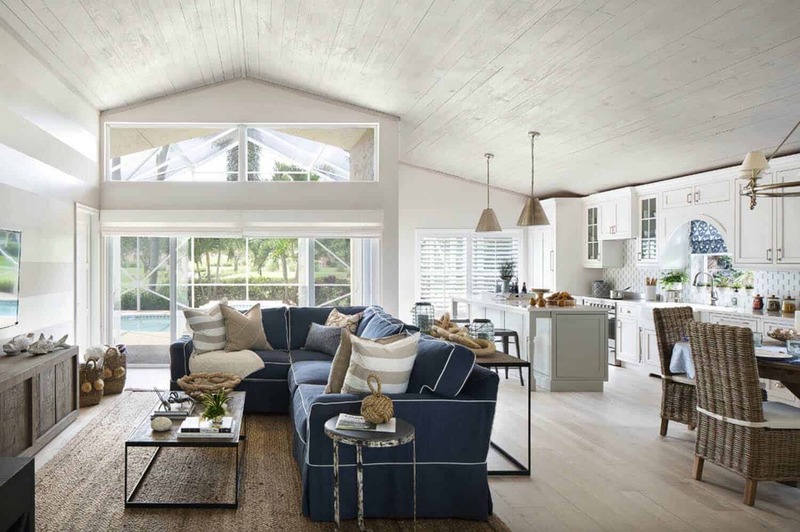 This cozy seaside cottage has undergone a complete renovation by interiors studio Lisa Michael Interiors, located in Delray Beach, Florida. Outdated and in desperate need of a makeover, the designer infused new life into the interiors. 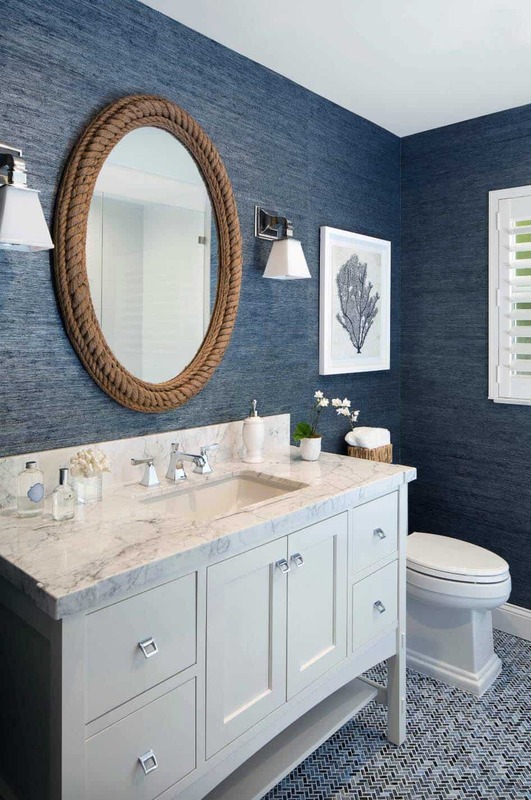 The renovations consisted of a custom designed kitchen and bathrooms as well as beautiful finishes throughout. A custom pine ceiling adds charm and character to this home. 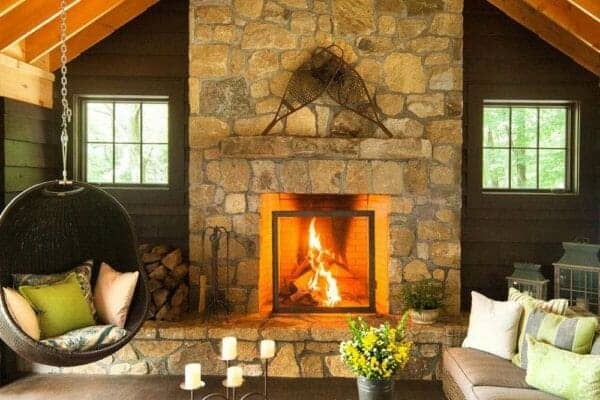 Casual furnishings and natural textures adds a sense of warmth and coziness. 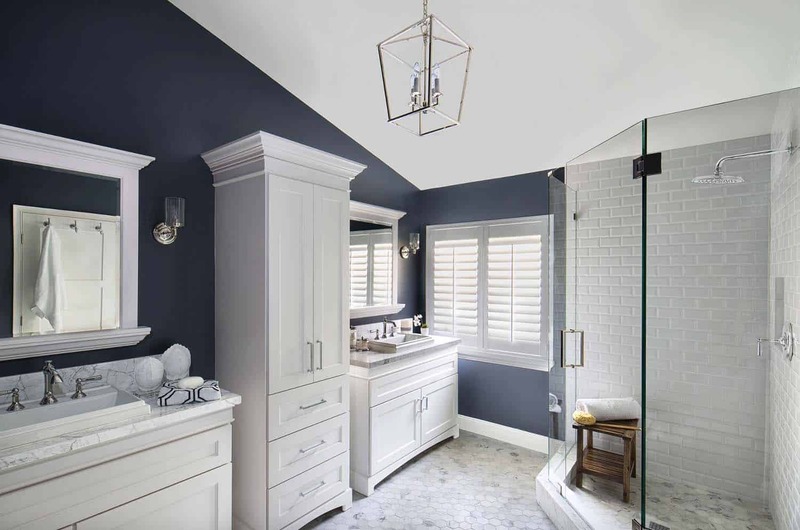 Above: The wall color is Balboa Mist 1549 | Benjamin Moore at 75 percent (white added). The stripes on the entertainment unit wall are Balboa Mist 1549 | Benjamin Moore at 75 percent with stripes at 100 percent, in a pearl finish. 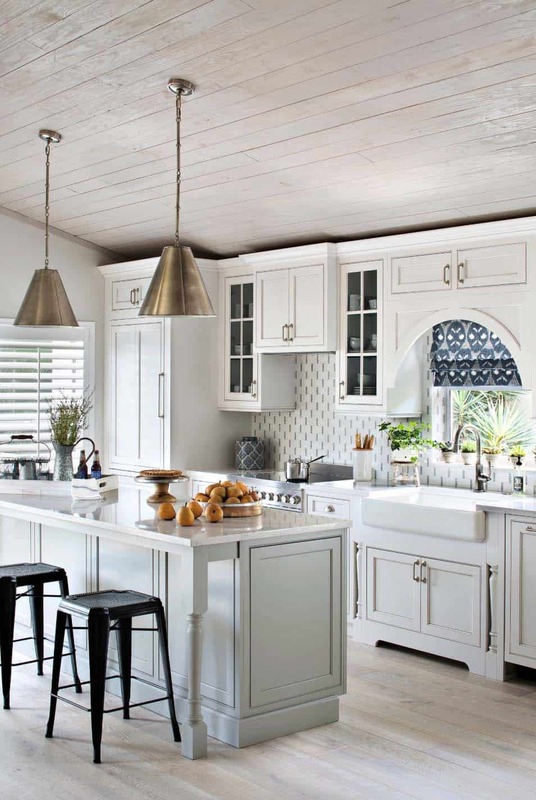 The interiors scheme of this home was inspired by the designer’s own experience on Cape Cod. Quintessential Cape Cod architecture is rooted in practicality and American style. 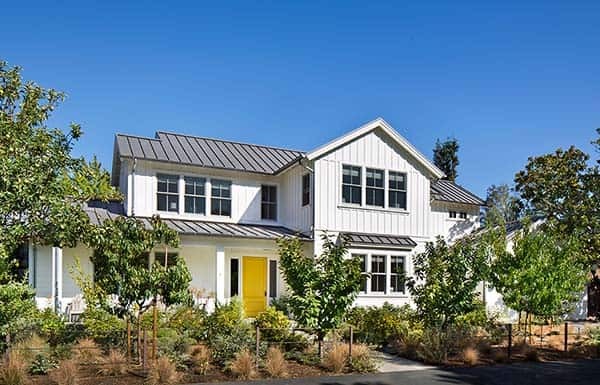 Just like the quaint homes along the coast, this home was designed to exude a timeless appeal while maximizing comfort. 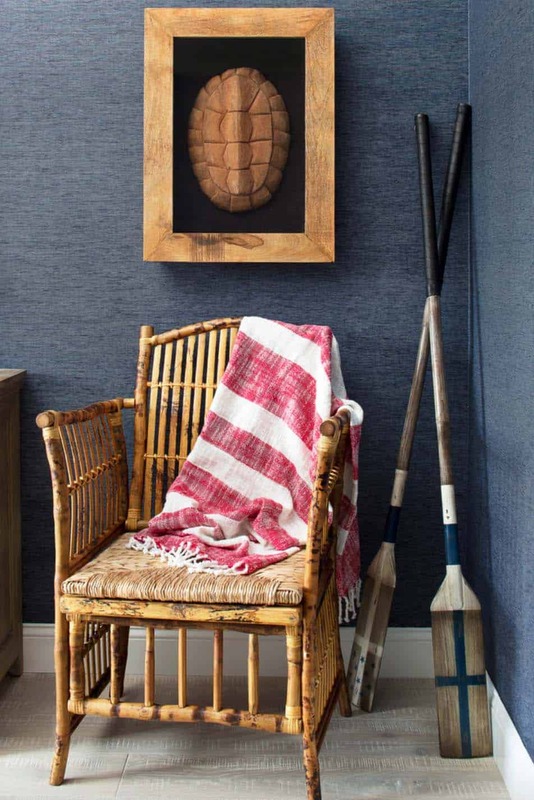 From the dining nook to the living room, nautical references and weathered finishes are in full force. 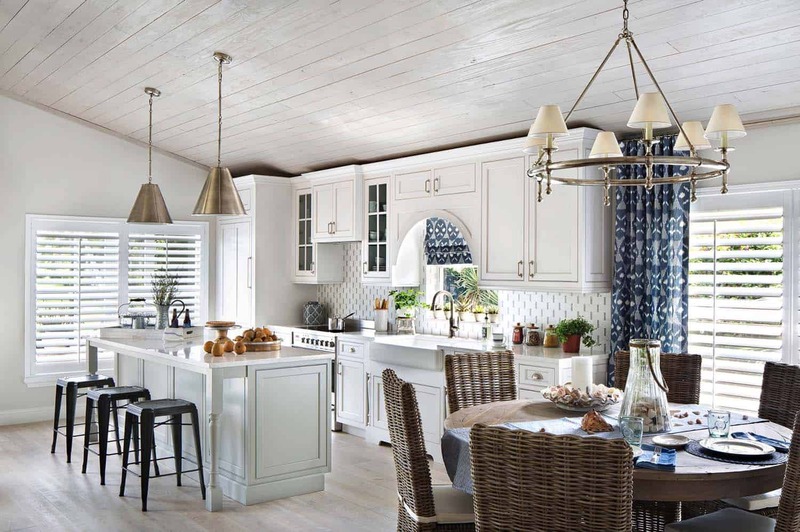 A blue and white color palette bounces off wood elements, like the pine ceiling that was hand-painted by Dana Donaty Designs and the reclaimed dining table from ACP Home Interiors. 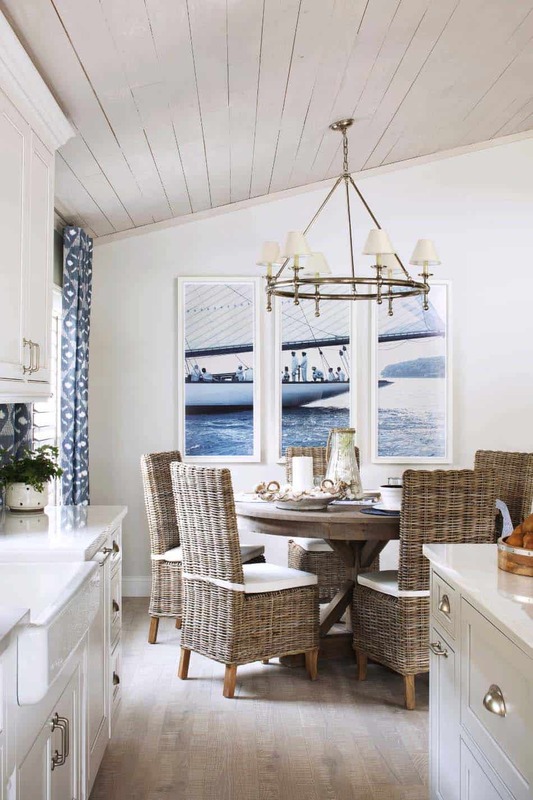 A maritime triptych recalls days on the water, while a sprinkling of shells, a nickel light fixture and natural fiber accents honor life surrounding the sea. 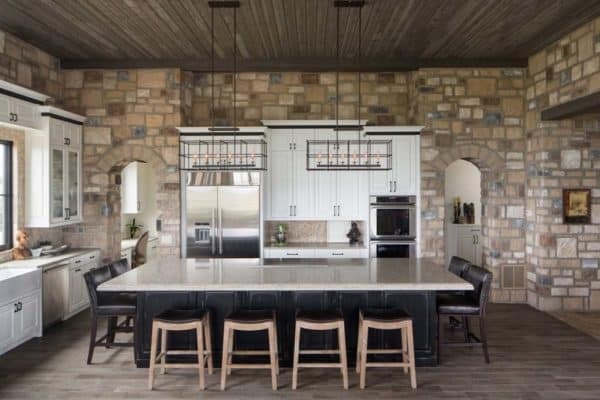 Above: The light fixtures above the kitchen island and dining table were both sourced from Visual Comfort. The flooring is an engineered White Oak with a whitewash. 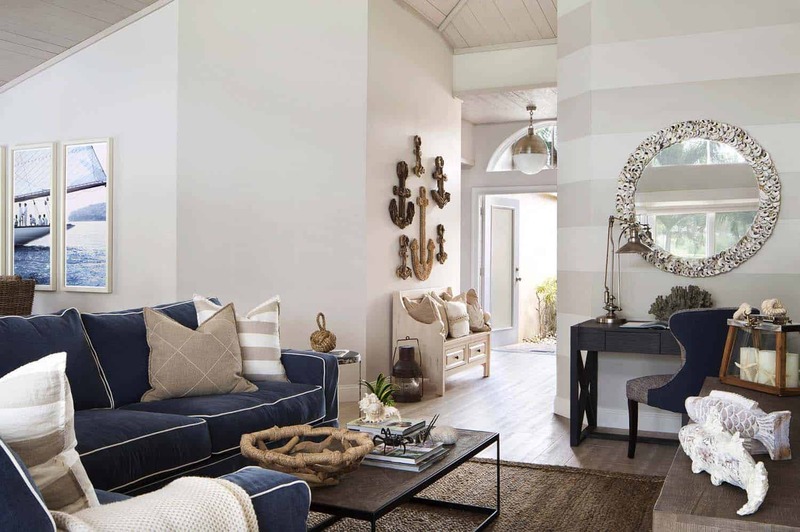 What We Love: This cozy seaside cottage offers bright and airy living spaces that are styled to be quaint and charming. We are loving all of the small details, such as the hand painted ceiling, nautical artwork and other elements that reflect the coast. 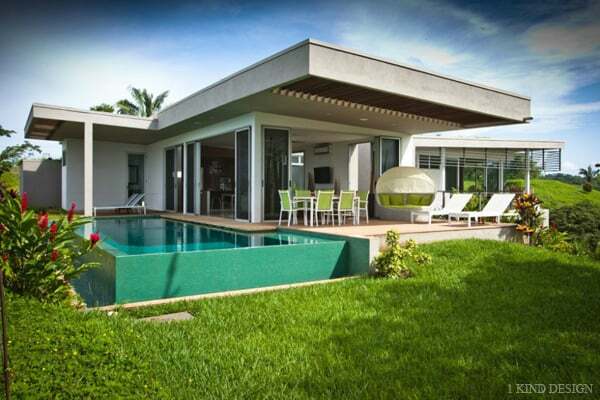 Overall this beautiful beach house would be a comfortable and relaxing abode to enjoy beachside living at its finest. 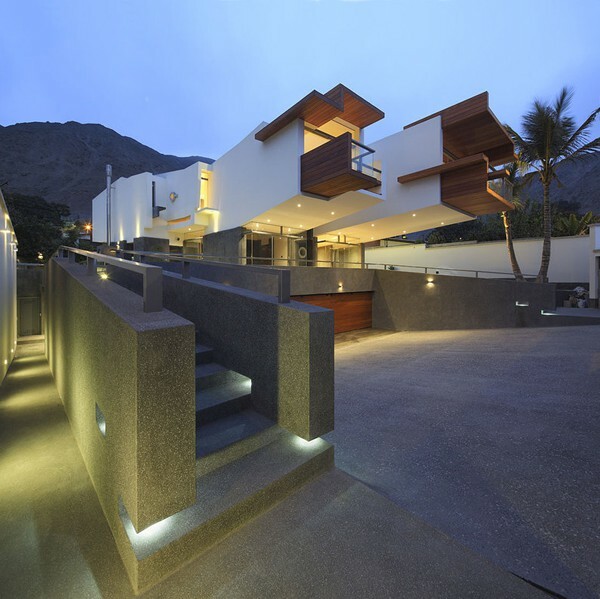 Readers, what do you think of the overall design of this nautically styled beach house? Are there any elements that stand out to you? Please share in the Comments below! 3570 | Extra Fine Arrowroot Denim. Above: The cabinet color is from the factory. It is called Pearl White from Omega. 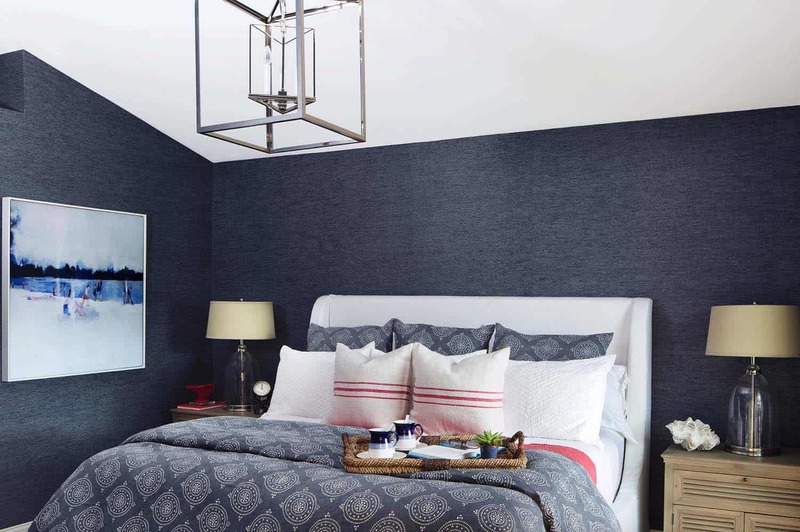 The wall color is Hale Navy HC-154 | Benjamin Moore. 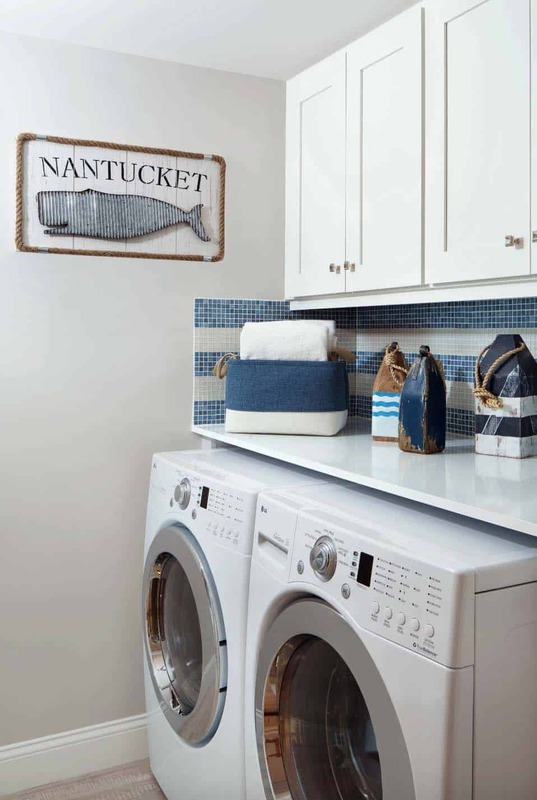 Above: The backsplash in the laundry room features two different 1×1 tile mosaics installed to create the stripes.